The leaves and branches of walnut are the source of brown. Popularly used as hair dye. Their use by ancient Andean cultures is well documented. The walnut tree is endemic in the Marcapata valley (Madre de Dios in Peru), is also cultivated in the mesothermal valleys. Trunk is thick and lush, its fruit is a drupe with an edible seed cells. Leaves and fruits contain gallic acid, caffeic acid, quercetin and kaenferol. The fresh leaves and fruits are used in the manufacture of cosmetics and traditional medicine. As an anthelmintic, the intake of nuts of walnut fruits of fasting, to expel the "lonely" Taenia sp. Cosmetics: face water with the cooking of the fruit peel and fresh green, to prevent the formation of wrinkles on the face. 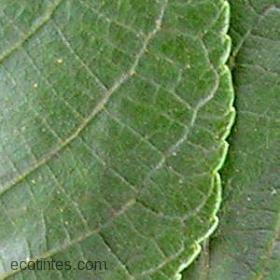 Swollen joints, and ground fresh leaves are applied as a poultice on the affected area. The walnut leaves decoction, it is recommended to neutralize the stress and negative vibrations by way of morning bath. The leaves and fruits of walnut with no more than 72 hours after collected, are used in dyeing craft to dye mordant brown wool with natural alum named "qollpa." The ponchos, vests and belts "chumpi" worn by the Andean farmer are brown and have been stained with walnut. 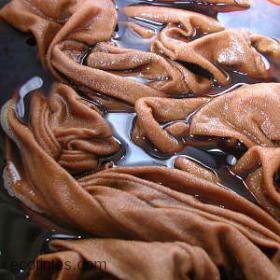 dyed dark brown wool with alum mordant. It stains the skin, remove the rind of the fruit of the walnut, the hydroxy compound containing colorless, is oxidized with air and gives a quinone, which reacts with active groups of the protein in the skin forming a quinone-protein complex colored . The fruit of the walnut juglone also contains gallic acid and caffeic acid, which are oxidized in alkaline medium producing dark-colored polymers. Colours made with Walnut by Ecotintes.